The communication ministry of the Western Province mainly centers on WORDNET Productions which produces a weekly half hour program. along with programs that relate the Bible to everyday life, some programs offer interviews with Catholics who tell the story of their faith in Jesus. 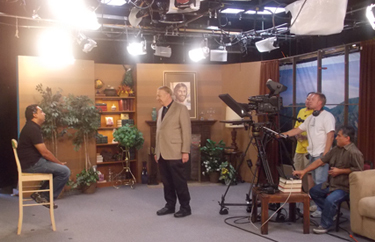 These programs are aired nationally and internationally on the Trinity Broadcasting Network, on seven Catholic Diocesan channels, on the US Armed Services Network and also made available on the wordnet.tv website. A daily reflection in video based on the liturgy of the day is made available in “Smart Phones” and tablets as an application known as igodtoday. WORDNET also produces various documentaries related to Christian faith, morals and vocation promotion. At present three of our confreres are fully involved in the communication ministry.